My husband and I have reached a milestone: Our five kids are “all grown up.” Here’s proof – our 18 year old son (the youngest) has registered to vote, registered for selective service, will graduate from high school in a few weeks, and recently attended his last prom ever. Facing this reality head-on, here is what we did. We opted out of a fun couples’ weekend in Vegas, allowing our son and his friends to use our home as their rendezvous spot. And then I fussed over their prom flowers. Let me say the teens were amazing, and so gracious about me wanting to get pictures of them, and of all the flowers – I’ll never get another chance, right?? Here is the group photo: Our son, Ian, is in the back row wearing grey and teal. Yellow ranunculus, white hyacinth, black ribbon and gold art wire. Beaded wristlet with hot pink ribbon, laser leaves, orchid and hyacinth. A rhinestone butterfly is hiding in there somewhere. laser leaves, a rhinestone butterfly and art wire. flower, ivory ribbon, and pearl-beaded art wire. white ribbon. 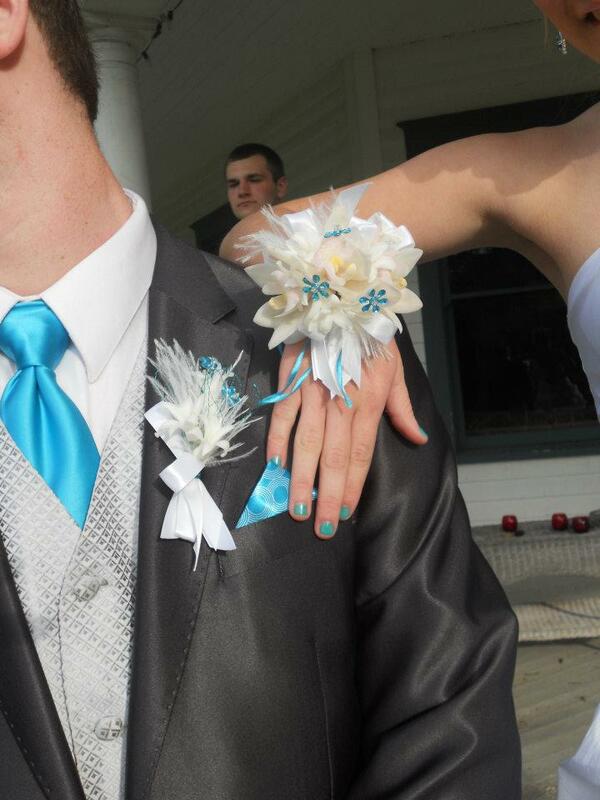 The corsage was on a teal bracelet. I love the gold ribbon rosette! It is so beautiful and different!